Walter Long, Secretary for the Colonies, inspects New Zealand troops near Bailleul, northern France, on 9 March 1917. Long is greeted by the New Zealand divisional commander, Major-General Sir Andrew Russell. They inspect the 2nd NZ Infantry Brigade and other units, including the NZ Pioneer Battalion. Long is escorted by Major Peter H. Buck (Te Rangi Hiroa). Reference F18200. 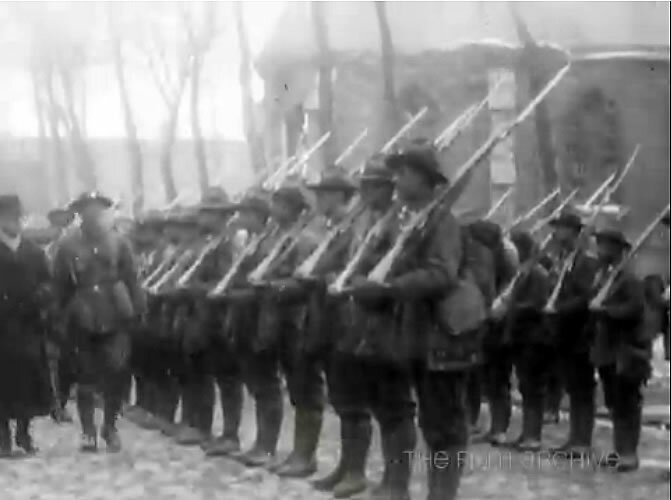 Video extract from Review of New Zealand Troops by Hon Walter Long, NZ Government / Pathé Frères, France, 1917. Extract courtesy of Imperial War Museum London.